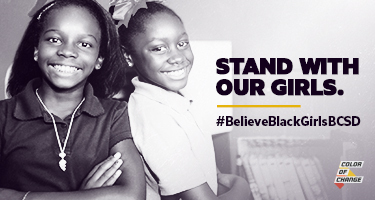 We believe Black girls. A school nurse and vice principal at Binghamton East Middle School stripped searched four Black girls because they were acting “giddy” at lunch and school authorities suspected they were using drugs. Normal behavior for 12 year olds was used to justify strip searching four young Black girls in front of adults and traumatizing them. After 200 community members showed up to a school board meeting demanding answers, Binghamton City School District issued a statement saying the girls weren’t stripped search, but were given a “medical evaluation.” This is unacceptable. The parents of the four girls confirmed that the 12-year-olds were told to remove their clothing so the school nurse and vice principal could search for drugs and other illegal substances. When one of the girls refused, she was suspended. The parents did not consent to their daughters being searched or given a “medical evaluation,” nor where they notified about the incident until AFTER it occurred. Black girls deserve to go to school and be happy in public without the fear of being profiled, strip searched, and punished when they stand up for themselves. Four Black girls were embarrassed and traumatized because school employees perceived their expressions of joy to be suspicious. It’s time for Binghamton City Schools to make this right and fire the employees who were involved in the strip search and ban the use of strip searches district wide.